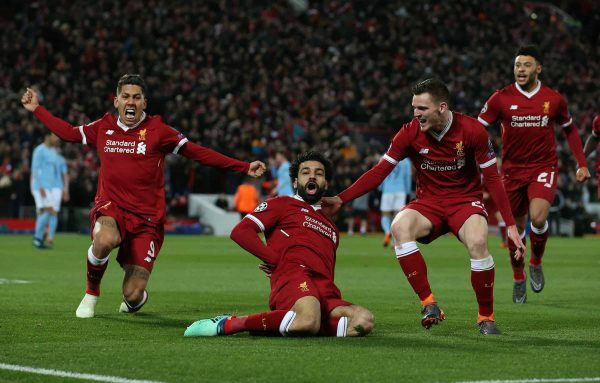 The whole Liverpool team shone as the Reds produced an incredible collective performance to take a huge 3-0 first-leg lead against Man City. The German, somewhat incredibly, had precious little to do on a night he was under scrutiny with a City bombardment on his goal expected. Did what he had to with minimal fuss and constantly looked to distribute quickly, which was helpful as the Reds stormed City in the first half. The lack of distance on his kicks in the second half was slightly frustrating but nothing costly. 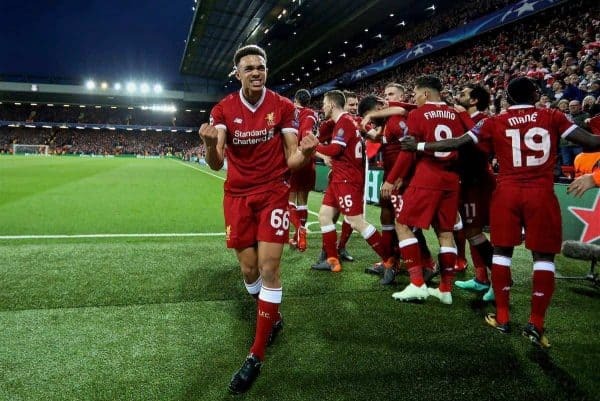 This was the biggest night of the teenager’s career, especially under added pressure from recent struggles, but he put those behind him and rose to the occasion with a magnificent display. Was pinpointed as the potential weak link pre-match but showed no such signs as he defended excellently, clever in his positional play and winning the one-on-one battle with Leroy Sane who saw his influence restricted. Was also crisp in possession and picked his moments to support the attack with impressive maturity. A man-of-the-match display on such a stage handed a timely reminder just what a talent this boy is. Recalled to the lineup as the last centre-back standing, Lovren had an excellent night on his return as the Reds posted a vital clean sheet. Was simple and effective with no-nonsense defending all night, clearing his lines decisively, winning key headers and making some vital blocks—one particularly crucial one as Kevin De Bruyne lurked to shoot. Exactly the sort of simplified role that suits his game and deserves full credit for doing it brilliantly. It is games like these that the towering Dutchman was bought for and he delivered a fantastic performance leading the back line. Won everything that came his way in air to defend the box with desire and determination, and showed great awareness to danger to cover well using his impressive recovery pace. Most pleasing was undoubtedly his organisation and leadership at the back, particularly second half when the Reds were under the cosh. Completely showed why the money was invested. Robertson just continues to go from strength to strength, with this another fantastic performance from the left-back. Shone in the league win over City in January and did again here as relentless marauding presence taking the game to Guardiola’s side first half—one lung-bursting run and shot was incredible. Defended impressively second half when on the back foot, doing a great job matching Raheem Sterling for pace and giving the ex-Red very little route into the game. A complete performance from a complete left-back. The captain had a huge job on his hands trying to retain control of midfield and provide valuable protection to the back four, but he did the job well after a nervy start. 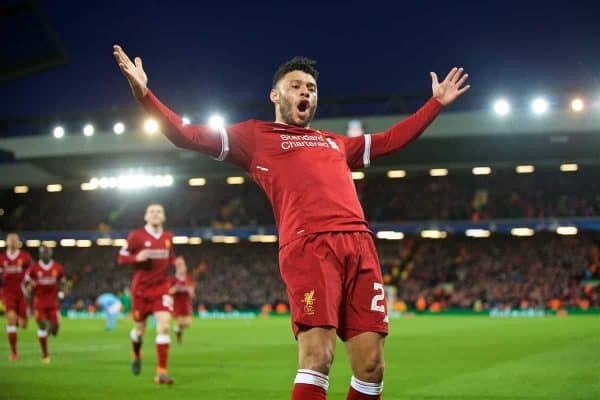 Backed up the sterling efforts of James Milner and Alex Oxlade-Chamberlain by buzzing around collecting second balls in midfield, and kept things simple in possession to get the danger men on the ball. Picked up a yellow card which sees him miss the second leg, which was a blemish on an otherwise very good night. There were a few concerns with whether Milner could cope with two starts in quick succession but the vice-captain put any fears to bed with a monstrous performance. Set the tone for the midfield battle from the off as he constantly won the ball back with the Reds on the front foot, doing a particularly great job buzzing around to stop De Bruyne playing. Played vital roles in the first two goals with a great ball to release Mohamed Salah for the first and winning a crunching tackle which landed at the feet of Oxlade-Chamberlain who rifled home. Always a wise head and great influence on such occasions and was so again here. A big performance was needed from the man becoming Liverpool’s midfield driving force and boy did he deliver. Was Man of the Match in the 4-3 league win over City and clearly took confidence from that display into this game. Bulldozed through the visitors’ midfield time and again first half to make things happen in the final third with some great runs, and hit an absolute thunderbolt of a goal to make it 2-0. 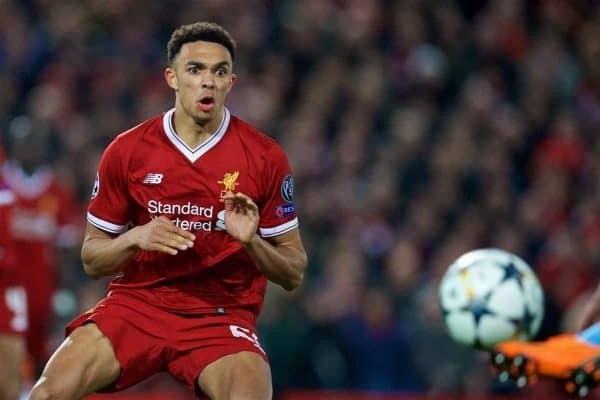 Also did his defensive duties impressively, providing key support to Alexander-Arnold with Sane and David Silva before moving into the attack second half where he filled in well. You always need your big players and main match-winners to perform on the big occasions and the Senegalese delivered at Anfield. 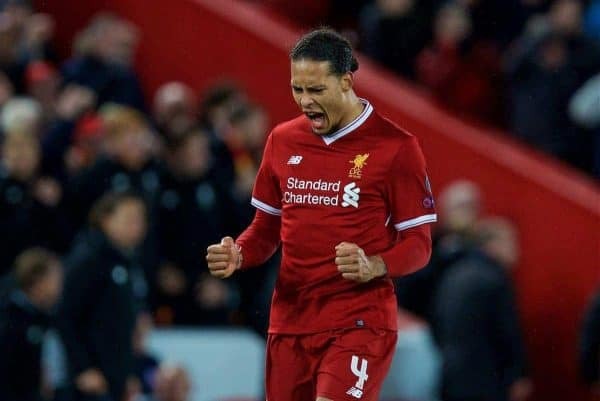 Scored the all-important third with a great header after some clever movement, but apart from his goal he impressed as he was a constant threat when the Reds were on top. Had less influence after the break naturally, but still looked lively on the break and also never stopped working to dig in and contribute to the tireless defensive effort. This was billed as a head-to-head between the Egyptian King and Player of the Year rival contender De Bruyne, and Salah outshone his main competitor at Anfield. Pep Guardiola deployed Aymeric Laporte simply to stop Salah but the No. 11 was simply too sharp and too difficult to pin down as he ran riot drifting from the right. Opened the scoring with a typical Salah goal being in the right place at the right time, and also provided a great cross for Mane’s header. A real dampener comes in the injury that forced him off after half-time—hopefully it is nothing serious. Needed the Brazilian to lead from the front to stop City settling into rhythm at Anfield, and he did so superbly with all of his typical industry and craft on show. Incredible work rate was in full effect for Salah’s opener as he made what was the most important toe-poke of his career to prod the ball in the Egyptian’s direction. Provided a great platform to spring attacks all first half while also working relentlessly, which makes him such a key component of Klopp’s system. 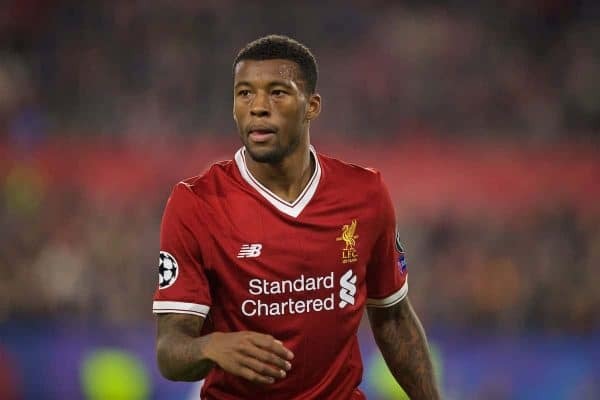 On into midfield, Wijnaldum had a big responsibility to help solidify the middle of the park with Oxlade-Chamberlain moving into the attack. Did a reliable job working hard to plug gaps City looked to exploit while also keeping things simple in possession. One nice burst and dangerous ball across to find Mane who couldn’t arrive in time to convert. Ran around as he entered to fill the left flank ahead of Robertson for the final minutes. Had his hands tied from before the first whistle due to the untimely injury crisis, which made it a night all about making the best of what was at his disposal. 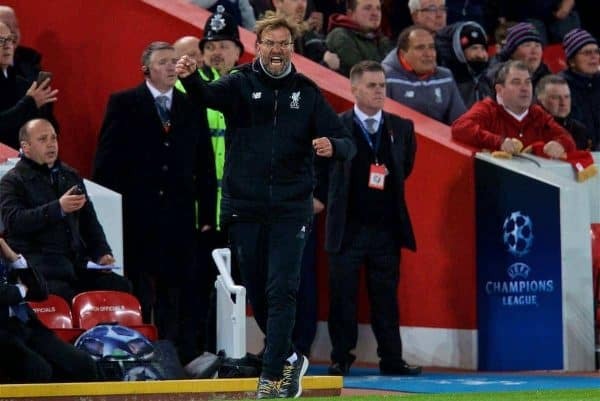 And he did so spectacularly, setting up the team perfectly tactically and mentally to produce the brave display called for one of the most astonishing for halves of football Anfield has likely ever witnessed. Settled his side at half-time and reset the Reds to manage the game after the break, and used his limited subs well to help see the game out—with Wijnaldum shoring up midfield and Solanke and Moreno offering fresh legs. It says everything about the way Klopp has this Reds team playing that Pep Guardiola changed what has led him to the Premier League title by going with a less expansive and gung-ho team. A perfect night for the boss who we are incredibly lucky to have.